Step inside and for someone who has driven the outgoing model, it all looks familiar. The dashboard layout is the same, but the dual-tone beige and non-reflective black colour combination is new. The new desert beige upholstery is bright and spices up the interior. The Golf-style flat-bottom three-spoke steering wheel looks like it belongs to an expensive car and is excellent to hold. The steering wheel gets buttons that control the audio system and the multi-information display. The MID controls on the steering wheel allows you to keep your hands on it all the time as its placement earlier was on the column stalk and the button was fidgety to use. The instrument cluster retains the two large dials with tachometer on the left and speedometer on the right. In between lurks the change – the multi-information display gets easy-to-read white fonts and the new function which shows the maximum speed is 250kmph, which we found a bit cheesy. The centre console and steering wheel boss get brushed aluminium surrounds adding to the premium look. Every bit inside the Polo you touch exudes quality, when it comes to the interior fit, finish and quality the Polo is right up there. Everything seems to be well put together and the interior is the best-in-class. The integrated audio system is compatible with USB, AUX-in, SD card, can pair with your Bluetooth devices and play your CDs too. The sound quality is decent and one won’t be disappointed with this system. It can take voice commands and the call quality with the phone paired to the audio system is good. The front driver’s seat with height adjustment and the telescopic steering wheel makes it easy to find an ideal driving position. The seats are supportive and are comfortable over long drives. We cribbed about the lack of sufficient lumbar support in the outgoing model which seems to have been fixed, but it can be better. The rear seat remains a weakness of the Polo. It hasn’t changed a single bit, the new specification sheet reads the Polo has a wheelbase longer by about 13mm, which aids the legroom getting a minor improvement complemented by the scooped out front seats. Seating three abreast is a task and the headroom is not the best-in-class, the Swift in comparison has a higher set rear seat and feels a little more comfortable than the Polo. The Polo boasts the largest boot capacity in the class at 294litre followed by the Hyundai Elite i20 at 280litre. 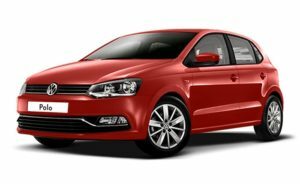 2016 Volkswagen Polo comes with safety features like dual front airbags, Anti-lock Braking System (ABS), central locking, seatbelt warning, crash sensor, power door lock, child lock, front and side impact beam, engine immobilizer etc.